History: Cheverly was founded in 1918 as a planned suburb, built to take advantage of nearby rail access. But the town’s history begins earlier than that– back in August 1814, British troops stopped by Cheverly’s two springs for water on their way to the Burning of Washington. Anyway, fast forward 100 years and the area was ready for development, as there wasn’t much there except for the beautiful Mt. Hope, a farmhouse from the 1830s. According to the town’s official history, Robert Marshall, an investor from Ohio, came to the area with a vision, “years ahead of his time, of creating a restricted, carefully planned residential community, convenient to the city by rail and road, but retaining the beauty of its natural surroundings through saving as many of its trees as possible, and designing its streets to follow the rolling contours of the land.” Cheverly was officially incorporated in 1931, and today over 6,000 residents call Cheverly home. Neighborhood Character: Imagine small town America, and you’ve got Cheverly. Brian, a lifelong Cheverly resident and photographer of the great images in this post, has this to say about it: “The great thing about Cheverly is its diversity of people. The town’s population is fairly evenly split between black and white. This has added greatly to the community, and is a great source of pride for all the town’s residents. 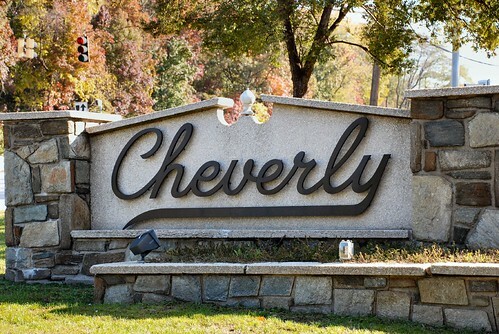 Cheverly is also a family town. In some ways, the town is a time warp to the 1950s, where you see parents walking their kids home from school.” This is a place where neighbors really get to know one another, and there’s a great deal of community activism. 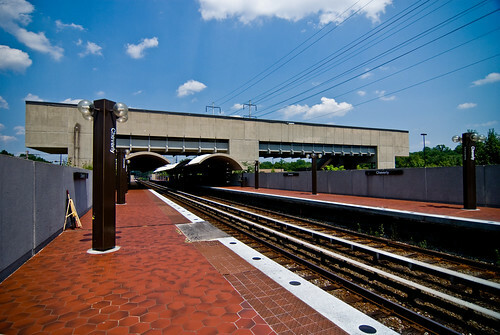 Transportation: Cheverly has its own Metro station on the orange line, and there’s good bus service connecting to Takoma, New Carrollton, Avondale, and Landover. While there aren’t Capital Bikeshare stations in Cheverly, there are plenty of cyclists in the area. And the residential neighborhoods are perfect for a stroll. That being said, many Cheverly residents do use cars to get around. Route 50 and the Baltimore Washington Parkway are nearby, and the Beltway isn’t too far either. Go outside! Cheverly features many fantastic parks, including the Cheverly Swim and Racquet Club (which is something of a community institution– Brian says, “Every kid who grows up in town ends up spending their summers here, and it tends to be where every Cheverly kid gets their first job.”). The Cheverly Publick Playhouse is a great performing arts venue that has been serving the area for over 60 years. Check out their schedule of events to see their music, dance, and movie offerings. The Cheverly Community Market is the place to be on Saturdays from 8 AM to noon at the Cheverly Community Center. This market features fresh produce from local farms, and as an added bonus they also feature local wines! Mark your calendar now for Cheverly Day, a May event that you won’t want to miss. The 2010 event featured an east-west softball game, a beer garden, lots of live music, and even a Cicada Crunch 5K! And that’s not to mention the fantastic fireworks show. 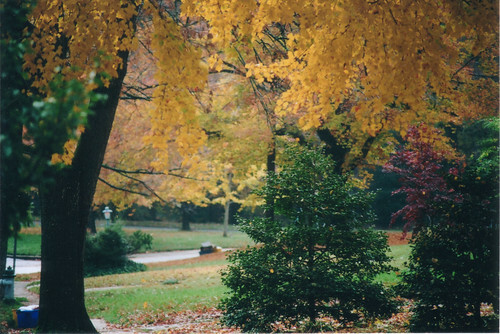 What’s Nearby: Cheverly, located in Prince George’s County, is southeast of College Park and directly east of our very first Where We Live featured neighborhood, Brookland. Why We Love Cheverly: Brian summed up Cheverly in just one sentence, saying, “Cheverly is where you live to raise a family and where you have all the benefits of the suburbs and the nearby city.” It’s a balance of rural and urban, with big city access and small town charm. For young families in the area, Cheverly has it all– neighborhood parks, beautiful tree-lined streets, affordable places to live, and a great sense of community all in one place. Great article… I moved to Cheverly just over a year ago… and it really is awesome! Cheverly also boasts the Cheverly Parents Resource Center (CPRC)–an active community group that runs thrice-weekly playgroups, monthly events, and two list serves to help parents and caregivers connect. I moved here over two years ago and absolutely love Cheverly. The neighborliness here makes it a true community and a place where I am excited to raise my children!